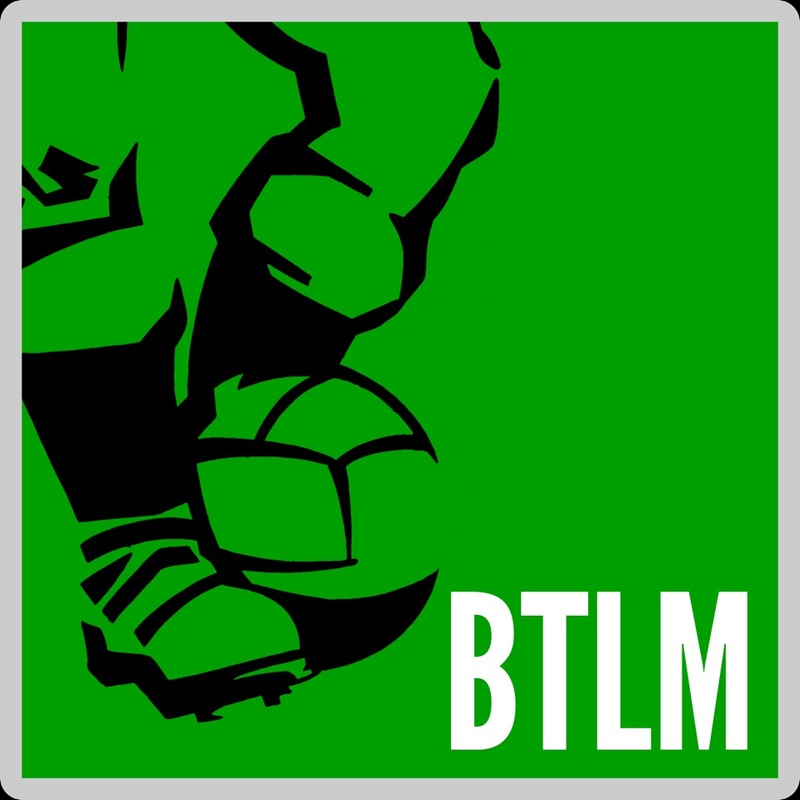 One of BTLM’s earliest entries in our regular Eleven series was an imagined team comprising the best French international footballers of traceable Polish descent. So large is the Polish diaspora around the world that there are similar fantasy teams of Polish origins that could be created for most major footballing countries, and with this in mind we welcome back guest writer Maciej Slominski who has used a little creative licence to formulate an unusual Polish / South & Central American selection for us. Maciej has christened his team Club Deportivo Polonia. This Eleven was inspired by Witold Waszczykowski, the Polish Foreign Minister, who recently ‘discovered’ a Caribbean nation called San Escobar that doesn’t actually exist. It got me thinking about Polish influence in Central and South American football and while there are fewer footballers in this part of the world with Polish roots rather than with Italian or German, there are some and they come with interesting stories. Initially I stumbled upon the manager of Racing Club Avellaneda who is named Ricardo Zielinski. His nickname is ‘ruso’ (Russian), not quite what I was looking for but it didn’t stop my investigations. There are indeed many footballers called ‘El polaco’ (The Pole) across South America, although the nickname doesn’t always necessarily infer Polish connections. For some reason inhabitants of Catalonia are also given this nickname which can be put down to many Sudamericanos having only a vague understanding of European geography. For instance Esteban Savleljich, born in Argentina, is nicknamed ‘El polaco’ but plays for Montenegro. To make it even funnier, in Podgorica everyone calls him…’Gaucho’. 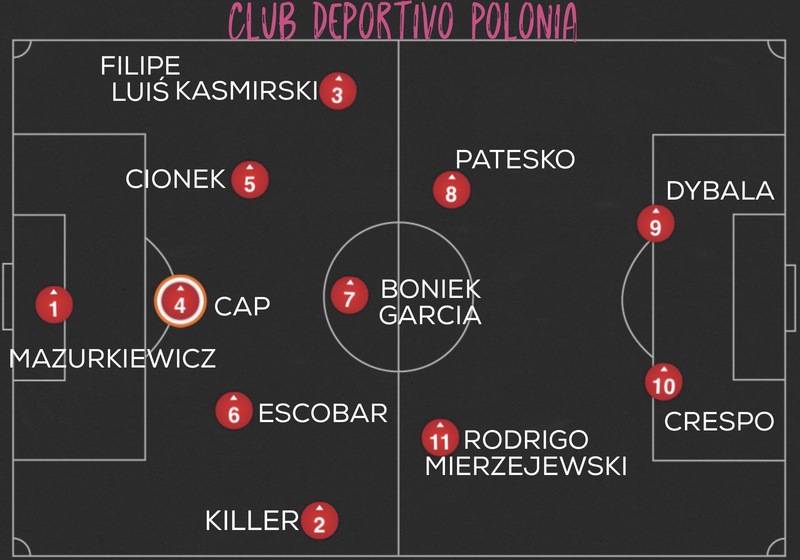 Below is my Club Deportivo Polonia line-up with, sadly, no player from San Escobar making the cut. There can only be only one man for the number one jersey: Ladislao Mazurkiewicz, widely recognised as Uruguay’s best-ever goalkeeper. In the immediate post WW1 years around eight thousand Poles migrated to Uruguay and Ladislao’s father Henryk, from Warsaw, was one of them. His mother was of Spanish descent. Ladislao took part in three World Cups (1966, 70 & 74) and one of his most famous moments came during the Mexican Mundial in 1970. Uruguay reached the semi-finals where they met Brazil and Pelé famously dummied a through ball, ran round the stranded keeper but pulled his shot wide in what has to be one of best known World Cup moments ever. Maybe it was Mazurkiewicz’s black outfit (his trademark, also worn by other greats of that time Lev Yashin and Gyula Grosics) that deceived the world’s greatest player. Four years later ‘Mazurka’, as he was called by his friends, travelled with the squad to the World Cup in West Germany where a disappointing Uruguay could only manage a point from their group stage games and departed for home early. If they’d finished second in their group, Uruguay would have met Poland in the second stage in what would have been the closest he ever came to playing against the homeland of his father. Mazurkiewicz died in 2013. This right back selection is a little tenuous, but since I discovered a player by this name I knew he had to be in the Deportivo line up. Daniel Killer has the same name (give or take an extra L) as a famous Polish movie from 1990s and there’s even a Latin American plot in the second part of this quite silly but well-portrayed look at the tough reality of life in 1990s Poland. Daniel Killer was born and lived in Rosario and played his football for the two major local clubs – Rosario Central and Newell’s Old Boys. He was a non-playing member of the Albiceleste World Cup winning squad in 1978. In the other full-back position on the left is a player whose grandfather arrived in Brazil during World War II from Kalisz in the Greater Poland region. When Filipe Luiś arrived in Poznań (the region’s capital) as a Deportivo La Coruña player to play Lech, he purchased many gifts, paintings and souvenirs to remind him of the old country. A journalist who met the defender was quite shocked when the player phoned him some time later to ask whether it would violate anyone’s copyright to record some Christmas carols in Polish! Filipe Luiś Kasmirski was a success at El Depor and earned a move to Atlético de Madrid with whom he has played twice in Champions League finals, both against Real Madrid – in 2014 and 2016. Filipe Luiś’s uncle Elias speaks Polish and teaches the language in a town called Massaranduba in Santa Catarina state. He has plenty of potential students in a region with around four thousand families who claim Polish roots. The 1974 World Cup was a disappointment for Uruguay and for our goalkeeper selection Ladislao Mazurkiewicz, however near neighbours Argentina fared slightly better. They were managed by ex-Racing Club defender Vladislao Cap whose father was Polish and whose mother was Hungarian. In their final group game Argentina required Poland to beat Italy in order to advance to the second round and the story goes that Argentinian Ruben Ayala (a striker playing with the number 2 on his back) handed $18,000 in cash to the Poles beforehand as an encouragement to try harder. Poland won of course, but the money disappeared. Years later Ayala was playing for the Mexican side Atlante along Grzegorz Lato and the pair discovered that Robert Gadocha had taken the money and never given anyone a cent. Gadocha, who lives in Florida nowadays, strongly denies any allegations. Cap’s role in the whole affair was never clear and he died suddenly in 1982 at the young age of 48. A Brazilian/Polish central defender. Although born in Curitiba, when he came to Poland to play for Jagiellonia Białystok everyone joked his playing technique was more Eastern European than South American. A no-nonsense centre-back who nonetheless took the trouble to learn his native Polish language, and as a result spoke it much better than other ‘foreign’ Poles like the French-based pair Ludovic Obraniak and Damien Perquis. In 2014 Cionek made his debut for Poland (he was playing club football in Italy by then) and took part in Euro 2016. With such a name this Colombian had to be in the squad. I’d never heard of the player but Latin American football expert Sam Kelly came to the rescue with some information about his nickname. Shortly before Escobar made his debut he was interviewed on a Colombian television programme that shows world football highlights and was discussing a match between a German and a Polish side. The Polish team had a player who not only played in the same position as Escobar (centre back) but also looked rather like him, so they jokingly called him ‘El polaco’, and the nickname stuck. The full name of this Honduran player is Oscar Boniek Garcia Ramirez with mostly the Houston Dynamo captain playing under the name of ‘Boniek Garcia’ – and yes, he was given this name in honour of the Polish legend of the 1970s and 80s. ‘Zibi’ played for his country at the 2014 World Cup without much success, but he has made more than 100 national appearances and scored three goals, two of them against arch-rivals El Salvador. Rodolfo Barteczko was a Brazilian left-winger who was very popular because of his skill and the colourful life he led. Born as a Polish émigré in Germany, (his mother was German) he arrived in Paraná, the capital of the Curitiba province which has the highest concentration of Poles in Brazil. Patesko took part in both the European-based World Cups before WWII and in 1938 he witnessed the dramatic 6-5 win for Brazil over Poland from the bench. The game featured 4 goals from the legendary Ernest Wilomowski and a hat-trick from the Brazilian star Leonidas. Argentine star of Inter, Parma, Lazio, Chelsea, Milan and three World Cups, but his grandmother was born in Poland. You didn’t know that, did you? Hence the nickname “El polaco”! Probably the best known member of this squad. Born in Santiago, this striker’s career saw him bounce back and forth between Chile and Israel. He won back-to-back domestic cups and a single league championship with Maccabi Tel Aviv in the 1990s. When he arrived in Tel Aviv the one word he knew in Hebrew was ‘shalom’. “You’re called Goldberg and you don’t speak Jewish? !” His team mates couldn’t have been more surprised. At one point, he was considered the second-best Jewish player in the world (after Sebastian Rosenthal) which was fine apart from the fact that he actually wasn’t Jewish! His grandparents had converted to Christianity during WWII. Goldberg was considered a respectable player for the national team but didn’t play much as Marcelo Salas and Iván Zamorano were at their considerable peaks in the same era. He scored four times in 13 outings for Chi-Chi-Chi-Le-Le-Le! Rodrigo Alejandro Goldberg Mierzejewski is currently a well-respected pundit for Chilean channel Canal de Fútbol, as well as writing for a paper called El Tres and studying architecture in his spare time. His Twitter handle, @polaco_goldberg, reflects his pride in his roots.